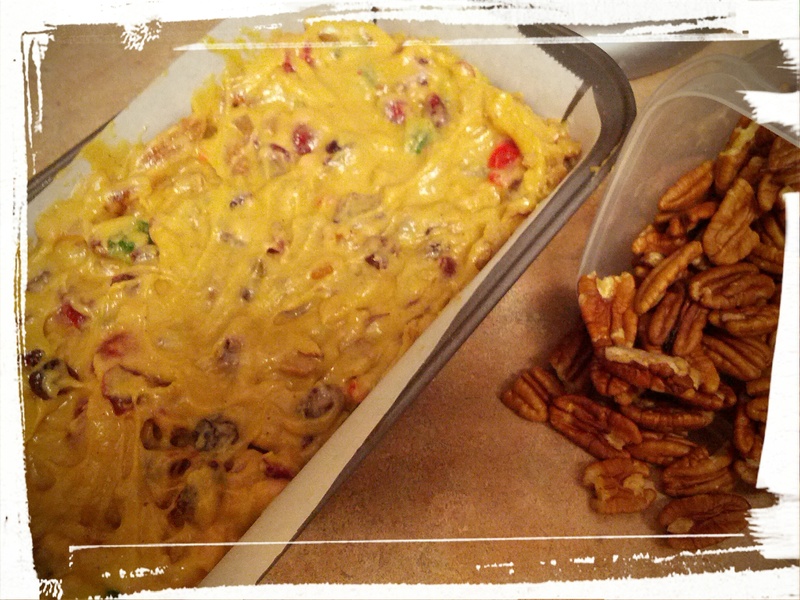 Fruitcake Smackdown: Marzipan-Covered Bar Form! Plus cakepops. 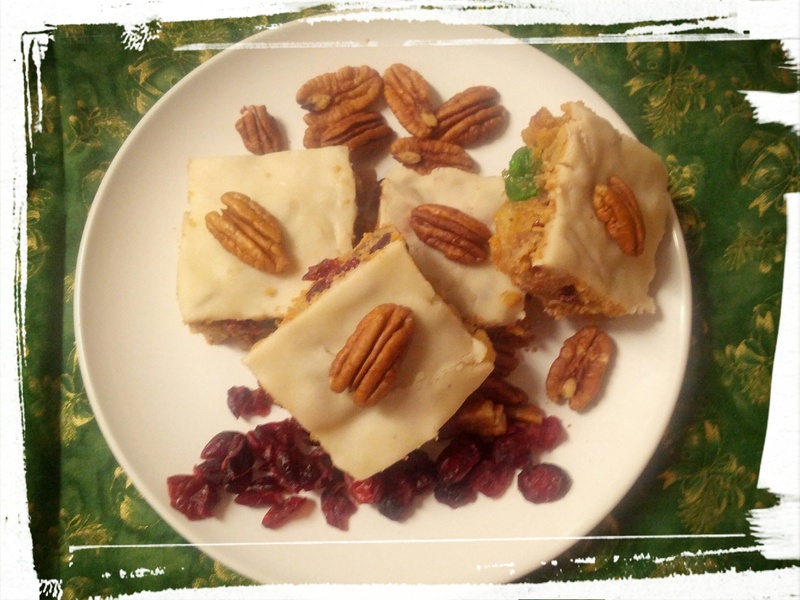 Fruitcake bars with marzipan frosting! The DH is still overseas, so I am continuing to sublimate my worry by baking. Baking, the panacea for all worries, since…forever? I can totally see a cavewoman doing this, far back into the reaches of time. Silly caveman out on a hunt for a wooly mammoth? Sublimate worries by collecting berries and grains and baking over a fire. Only I’ve taken it a step further and turned the berries and grains into marzipan-covered fruitcake. What can I say, I have a fanciful mind! And speaking of fancy, I decided to take this fruitcake up a notch by adding topping it in marzipan. Have I ever tried this before? No. Do I like it when it’s done in stores? No. Do I think it looks pretty? Yes. Well then! Top it in marzipan, I shall! With marzipan leftovers from my Boeterkoekjes recipe. Want some pretty marzipan-topped fruitcake bars for yourself? Let’s bake it up! Full o’ nuts! And fruit. Lots of boozy fruit. Mix fruit together and soak in rum. Cream butter and sugar together. Beat in egg. Mix 1/2 c. flour with spices. Add to egg/butter/sugar mixture and mix until just blended. Stir remaining flour with fruit/rum mixture and add in nuts, stirring again. Stir in fruit/nut mixture into dough mixture. Spread into parchment paper lined 9 x 9 inch pan. Bake in 325 degree oven for 1 hr. or until knife inserted comes out clean. Let cool on cooling rack. Roll out marzipan on wax paper. When cake is cool, place rolled marzipan on top of bars, and press to attach. Slice into bars and eat with gusto! This recipe is very much a trial one. I didn’t have any homemade candied pineapple left from yesterday’s smackdown recipe, Rummy Fruitcake, I hadn’t had a chance to go to the store to buy some, and I didn’t feel like making a new batch of candied pineapple, so…I just dumped in a can of pineapple slices, cut into chunks. I also didn’t add a rising agent, but a number of recipes on the web don’t use one either so I thought I’d try it out myself! I’ve peeked in the oven as it’s baking and it doesn’t seem to be rising (duh!) so perhaps I might suggest adding a 1/2 tsp. of baking soda to your recipe. Fruitcake! In cake pop form. 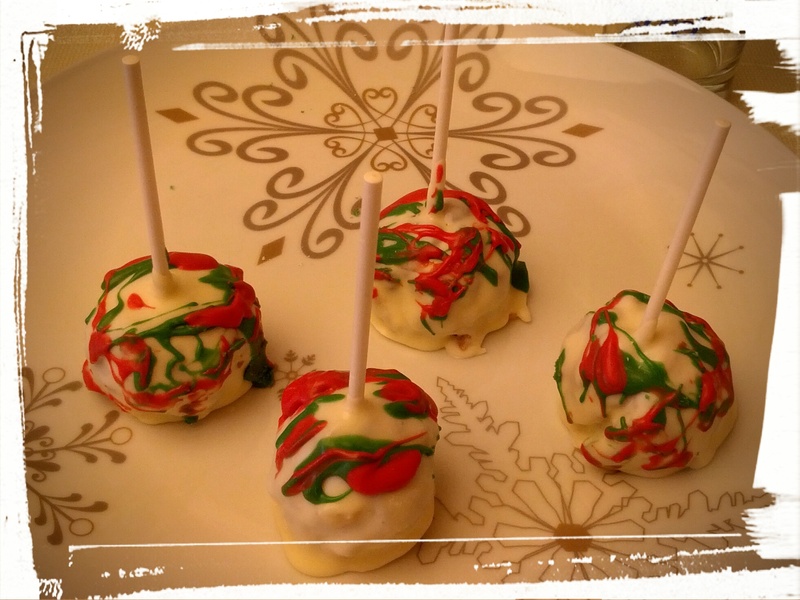 Edit: I turned the leftover cake into Fruitcake CakePops. Very easy! Take the fruitcake and break it into little pieces. Mush it all up with your fingers. (The juices from the pineapple will hold it together.) Freeze in small balls on a baking tray. Take out and stick lollipop sticks into them when slightly defrosted. Freeze again. Melt chocolate in a mug (see here for directions) and dip the frozen fruitcake pop into the melted chocolate. The cold from the frozen pop will harden the chocolate right away. You can drizzle other chocolate colours on it. I only kind of drizzled, because I…ate most of the chocolate, so there wasn’t much left to drizzle. *grin* Oh well. I served them for a New Year’s Day lunch, and my family really liked them! They taste exactly like fruitcake, but in cake pop form, with a nice crunch and sweetness from the white chocolate coating. Yay! I managed to turn a kitchen fail into a win! And, the Smackdown Verdict? The traditional loaf is a winner! The squares and cake pops are cute and all, but the loaf just tastes better. Probably because it rose. And therefore tasted lighter. What’s your favourite fruitcake recipe? Let me know in the comments! Next Post: It’s a Bake-a-Long post! Gingerbread Buche de Noel? Or Cranberry Crunch Tart? The ingredients for both are in my fridge. Can’t decide which one to make though. Any preferences? This entry was posted in Cakes, Desserts Not Otherwise Categorized, Recipe Smackdown, Uncategorized on January 2, 2015 by Margaret. I love fruitcake. There. I’ve said it. I know it’s much maligned, but I really do love it. My mother used to make it when I was younger, and I used to hold up the slices to the light and try to see through the fruitcake, imagining that the candied fruits were pieces in a stained glass window. The candied pineapple was my favourite, because it was in bigger chunks and you could see through it better; then I ate the red cherries, then the green, and then the candied citrus peel. The raisins, currants, and nuts were eaten last, along with the rest of the slice. 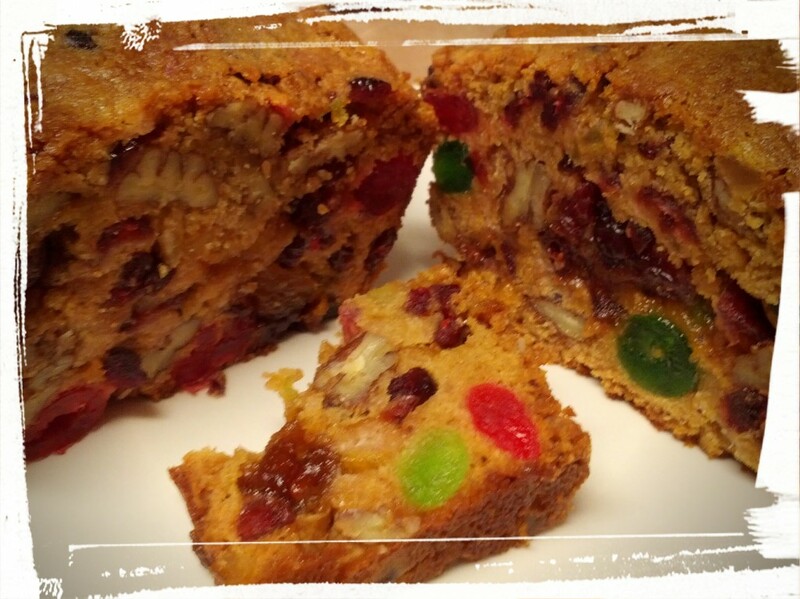 Are you a fruitcake-lover? Let me know in the comments! I really don’t know why fruitcake gets such a bad rap — it’s delicious! Fruity and fragrant and moist, it’s a mouthful of yummy-ness! I wish it was around for more than just Christmas-time. And in that vein, Christmas may be over, but I want me some fruitcake, so a fruitcake recipe smackdown it is! I’ll be making fruitcake today, and fruitcake bars next. So not quite apples to apples, but apples to oranges. Eh. It’s all fruit! I bought the candied fruits before Christmas, and I have to say, even though I bought them at a bulk store, they weren’t exactly cheap. Christy of Southernplate.com says that her mother buys candied fruit after the holidays, when it’s on sale, and then keeps it in her freezer until the holidays roll around the following year. I may have to try that! I couldn’t find any candied pineapple, so…I made my own! Using this recipe. It was pretty easy. Easier still? Buying it! But I wanted to bake tonight, so make it, I did. I bookmarked lots of different fruitcake recipes, and then modified a few to come up with my own version. Want to bake some delicious fruitcake yourself? Let’s! Prepping the fruit — just add alcohol! 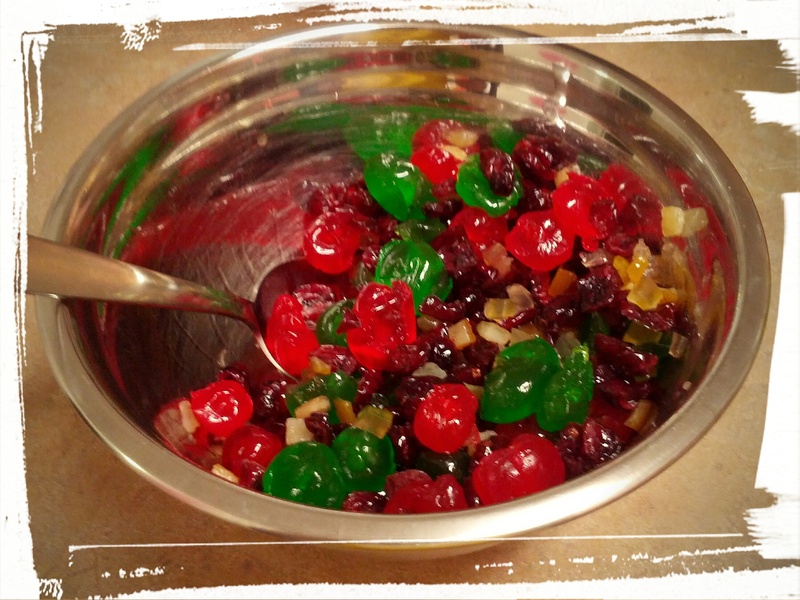 Mix together all the candied fruits and stir with the rum. Let sit for at least an hour, preferably until all the liquid has been absorbed, stirring occasionally. Beat butter and sugar together until creamy. Beat in eggs and extracts. Mix in 1/2 c. flour, baking soda, cinnamon, and allspice. Mix 1/2 c. flour with fruit and nuts. Stir fruit and nuts into batter. Pour batter into a prepared loaf pan (I lined mine with parchment paper). Bake in 275 degree oven for 3 hours, or until knife inserted comes out clean. Pre-baking — dough is tasty! Ask me how I know. Pro Tip: Fruitcakes need to bake on low temperatures, which is why they bake for so long. If you find your fruitcake is getting dry on top, put a container of water in the oven along with the fruitcake. The water will evaporate and help keep the fruitcake moist. Basically, this cake is candied fruit and nuts, held together by a smidgen of dough. I don’t like the classic raisins in a fruitcake, so I used dried cranberries, and I prefer pecans over walnuts or any other nut in a fruitcake, so that’s what I used. But feel free to substitute! I’m going to baste this cake in rum as is (I couldn’t find cheesecloth at my local store), repeating until the DH comes home. Then it’s time to eat the cake! Unless I taste a slice, you know, for taste-testing smackdown purposes. I think that’s a good reason! In the meantime, I’ll making fruitcake bars, that I can eat before the DH comes back. Knowing my penchant for snacking and my love of fruitcake, I don’t expect any of the fruitcake bars to be around when he’s back. Ah well. Lots of salad for meals to make up for it! Next Post: Either the fruitcake bars, or a Bake-a-Long recipe. Preferences? This entry was posted in Cakes, Recipe Smackdown on December 29, 2014 by Margaret. I first made a variant on this recipe last year, when I had just come across the instructables.com site, and was ogling all the delicious recipes on it. Although it’s called Texas Caviar, it’s actually just a freshly chopped salsa, albeit with some heat from jalapeno peppers. Different people make it differently, and I make it slightly differently each time I make it. Each is delicious! This version is H-O-T, so be sure to serve something cool with it, like rich sour cream, or a nice icy drink. I like heat, so I’m ok with it, but I have to say, I left out the hot peppers in the part that I set aside for the DH, or else he’d never eat salsa again. 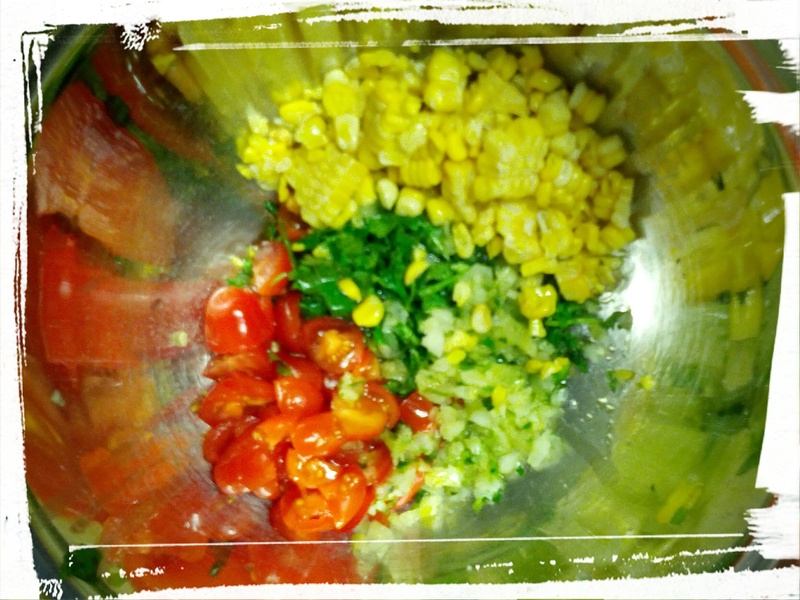 Let’s get making some salsa, yo! Mix all ingredients together. Chill in fridge to let flavours meld. Serve with chips. Wait until someone takes a bite and yell, BAM! I’VE KICKED IT UP A NOTCH, a la Emeril. Packs a wallop and keeps on kickin’! I’ve packed some on top of a bed of lettuce for my lunch tomorrow, with the juices serving as a sort of dressing. I had an IBS attack at work the other day, and then had a vaso-vagal reaction as a result (the combination? What I suspect pregnancy labour is like. Yeah, it was that bad), so I have to watch my diet again, and this will help up my fibre intake. It might also burn my mouth, it’s so hot. I live dangerously, what can I say. The Salsa Smackdown Verdict: I think I actually prefer the first recipe. 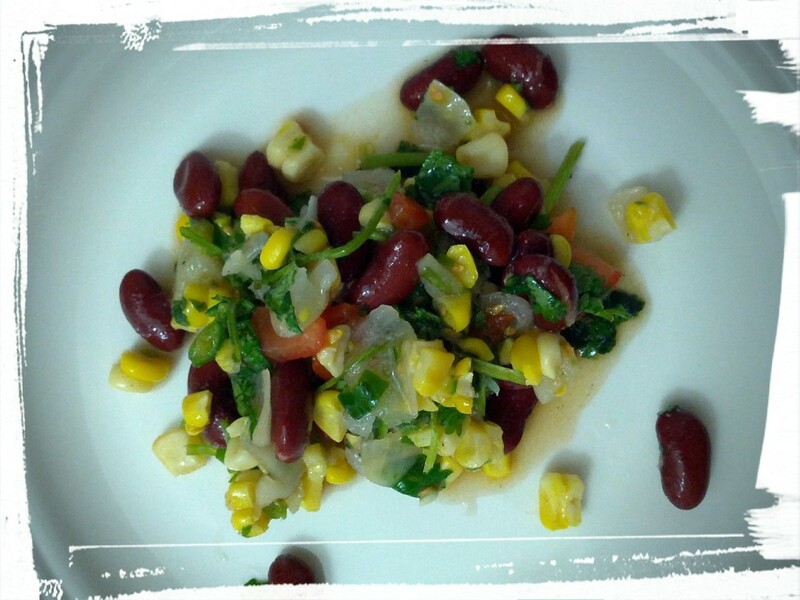 It has a nice tang with the lime juice, and can be eaten as a salad or side dish. I think today’s recipe might be nice in a seven-layer dip, as the heat and flavour need to be toned down by other ingredients, even though it’s tasty. Hmm. Maybe I should make a seven-layer dip tomorrow! Mmm…want dip now. 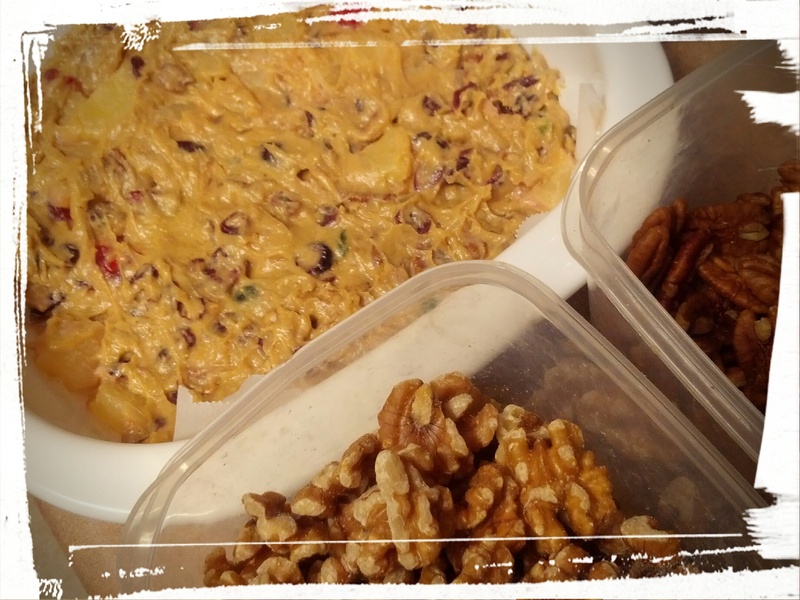 This entry was posted in Recipe Smackdown, Snacks on October 8, 2014 by Margaret. Remember my first Recipe Smackdown, about Lemon Poundcakes? Well, it’s time for another one, a Salsa Smackdown! 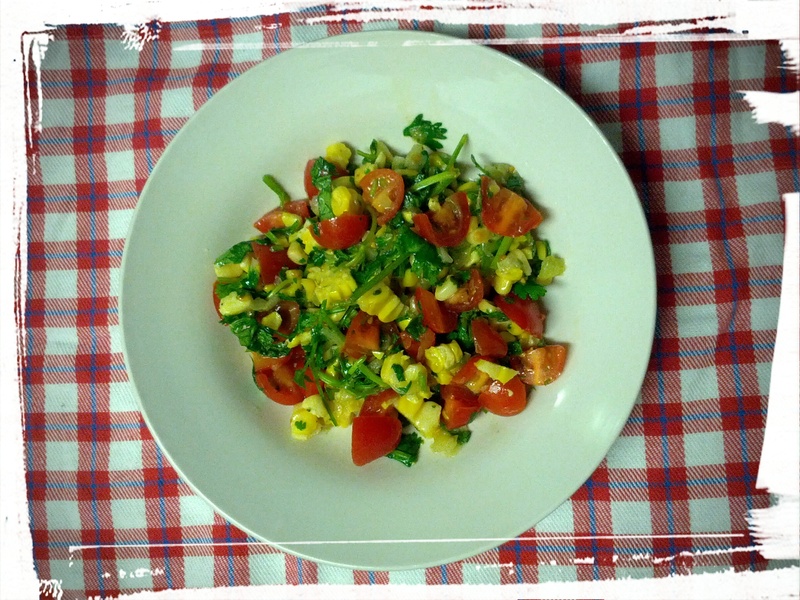 Today’s salsa recipe is a Corn and Tomato Salsa that tastes way better than the boring name suggests. I tore it from a free magazine in a subway newsagent stall. Let me see…it’s from the mid-summer 2014 edition of Our Homes magazine (I think it’s published by the building industry). As soon as I saw it, it reminded me of another salsa recipe I tried last year, called Texas Caviar, which will be the other salsa recipe in the very exciting and cutting edge SALSA SMACKDOWN! We chop! We toss! We EAT!!! *the crowd goes wild* Rawwwwwrrrr! Enough with the histrionics. Let’s get our salsa on! The recipe called for grilled corn but I don’t feel like going out to the communal grill in my condo and cleaning the burnt meat juices off it, so I just microwaved the corn. I’m sure grilling the corn will add a nice caramelized/smoky taste to the finished product, so by all means go for it, but I shall cut my cooking time and go for the easy out. I also used frozen onion as opposed to fresh onion, because a few months ago I bought a 10lb bag of onions (more correctly, the DH bought a 10lb bag of onions) and I chopped them all up and froze them so they wouldn’t go bad before I used them all. Fresh onion would definitely be better, but again, easy is good. And I didn’t have a tomato, so I used a handful of grape tomatoes. See? This is why I call myself the Queen of Substitutions! 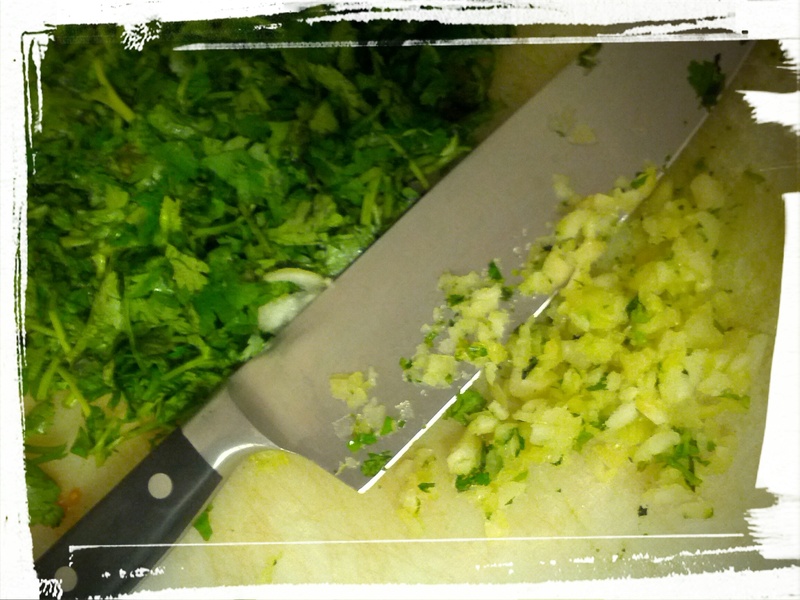 Rustic vs. finely chopped. Eh. Each to his/her own. Dump and toss. Let sit to let flavours marinate. Or eat right away. Is good! 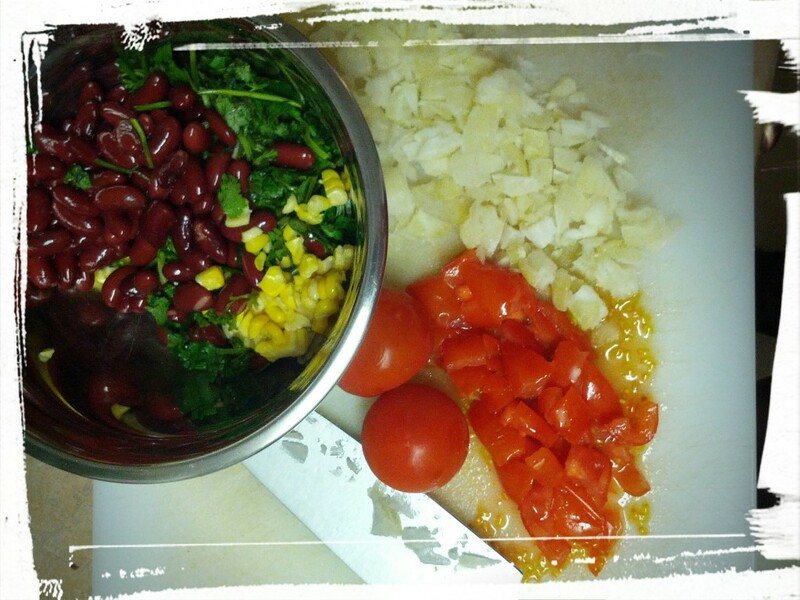 Fresh ingredients = fresh flavour! 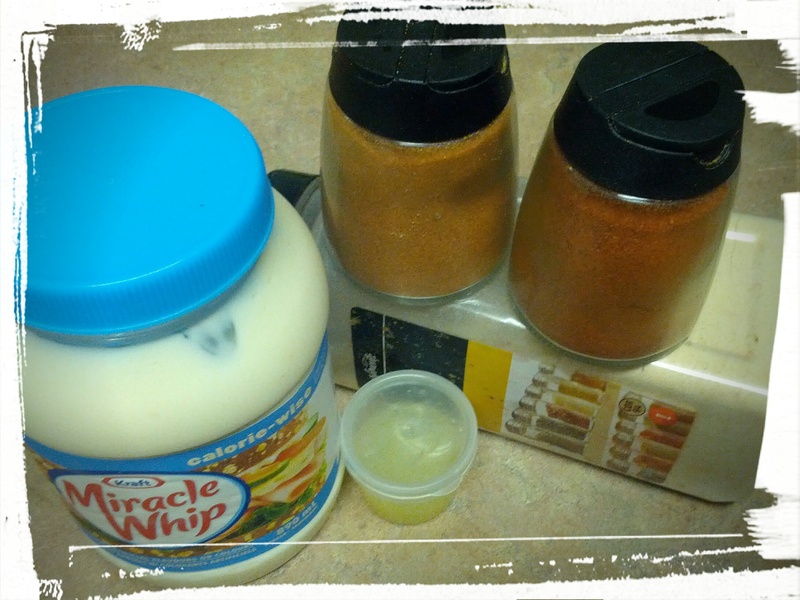 The same article that I found the recipe in also had a recipe for a chili-lime mayo. The DH and I are going to have veggie burgers for dinner, with the salsa I just made, and I thought that the mayo would be a nice touch too. So shall we? Dump and mix. Let flavours meld. Taste test. Glug water to offset burning. Brand name ingredients or not. Who cares! The mayo actually is really hot. I added the cayenne powder because I thought the chili powder might not have enough kick. Ha! This kicks and keeps on kicking. I think it’ll be great on my burger tonight! Mmm…I want the burger now! Maybe I’ll just sample the salsa again, yes? 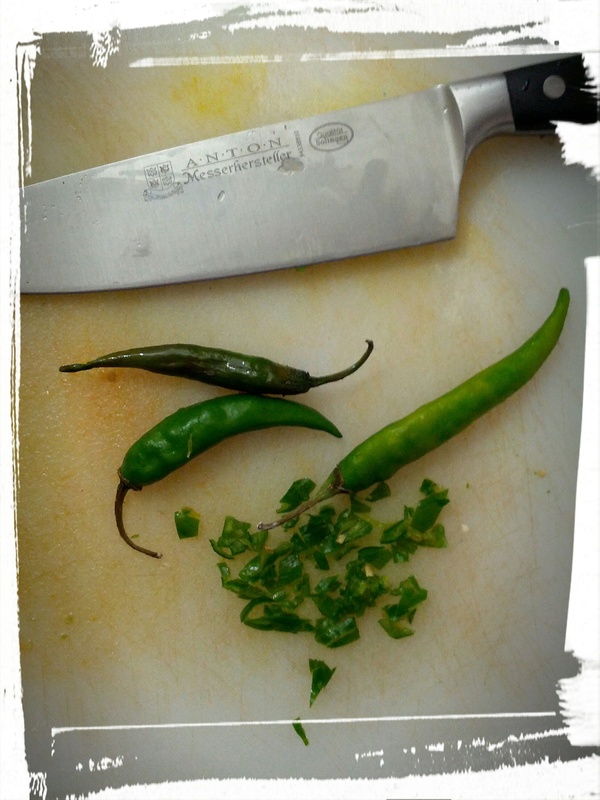 Next Post: Salsa Smackdown Part II, or, Everything’s Hotter in Texas. 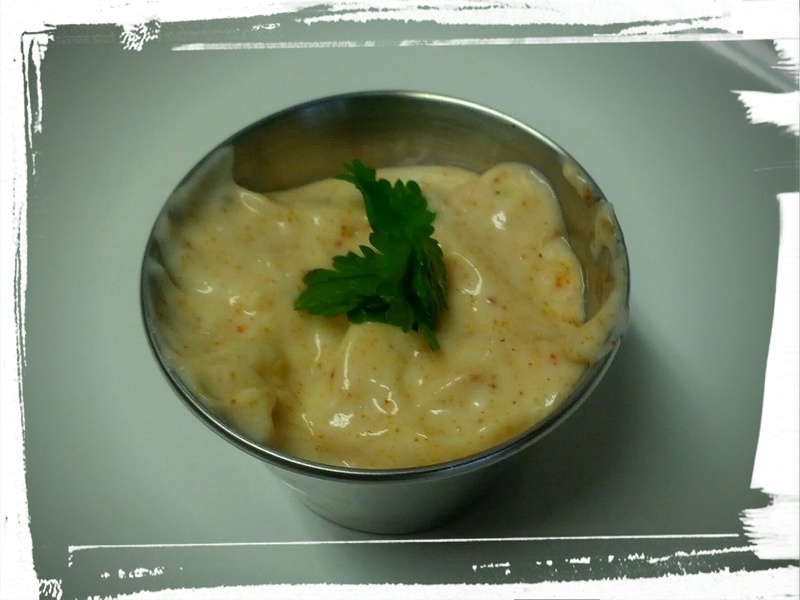 This entry was posted in Recipe Smackdown, Snacks on October 4, 2014 by Margaret. Last night after work I came home and started on the second of the pound cake recipes, the one that I found on the back of a notecard. I followed the recipe pretty closely, although I was a bit surprised at the amount of sugar it asked for, 2 1/4 cups. I did make one “mistake” though, and that was to microwave the butter to make it soft. I forgot that about 15 seconds is all the butter from the fridge needs in order to make it room temperature (sometimes 20 seconds) and left it in there for 30 seconds. Well. Puddle o’ butter! 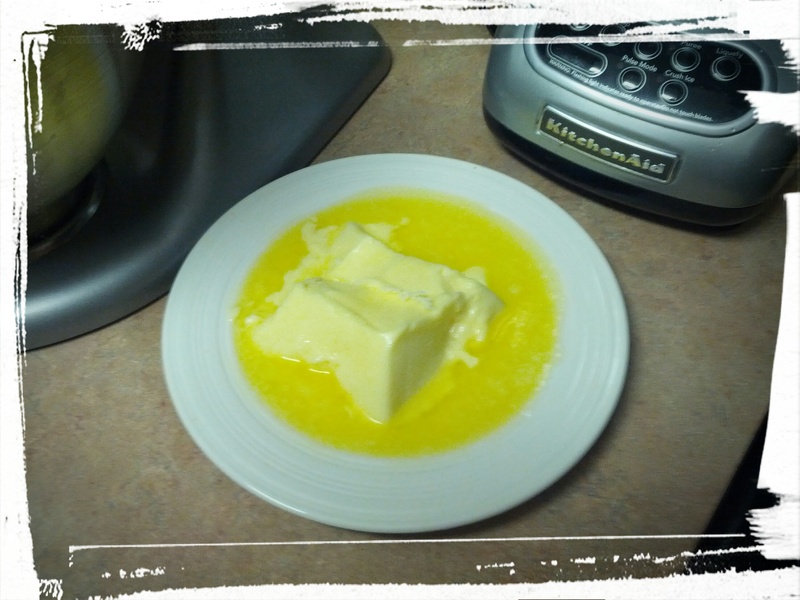 I know that once butter is melted, it doesn’t solidify back into butter, it’s sort of more like ghee, but I thought, eh, good enough, and dumped it in the mixer. 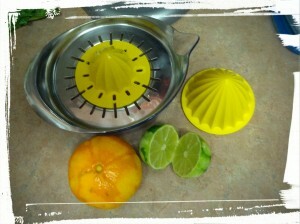 The recipe called for “the grated zest of 1 orange, 1 lemon, and 1 lime”. 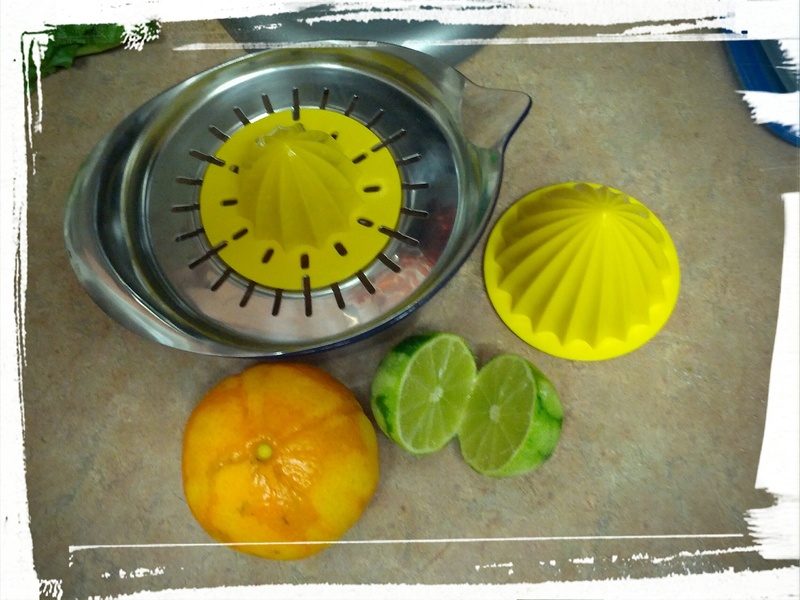 I zested a lime and a giant clementine, after thoroughly washing them (ideally, zested fruit should be organic. Who wants zested pesticides?) and then juiced them and saved the juice for the glaze. I dumped the zest in with the rest of the ingredients and mixed it all up! I tasted the batter…so good! The clementine zest was a great idea, making it more citrusy and less all.about.the.lemon. I ignored the recipe calling for 1 teaspoon of lemon extract, because I don’t have any, so whatevs. 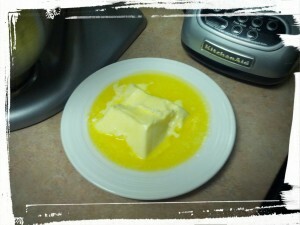 Cream the butter and sugar together, and when all fluffy and yellow looking, add the eggs one at a time. Mix the wet ingredients together in one bowl and the dry ingredients together in another and add them to the butter/sugar/egg mixture, alternating between the two. Pour into a greased 6-cup Bundt cake pan and bake for about 50 minutes in a 350 degree oven. Mix it all up. Pour over top of cooled cake. You know how the recipe said to use a Bundt cake pan? Well, I wanted to make this for the DH to take to work but I needed to taste-test it myself and I can’t exactly take a slice out of a Bundt cake and then send the rest in with the hubby (“Here’s a cake. Minus a slice. Enjoy!”) so I used a loaf pan and a half-pan of mini Bundt cake shapes, thinking I’ll eat the mini Bundts and the DH’s office can have a nice, big loaf. Well. Do NOT do that. The recipe really makes at least two loaves, so when I poured most of the batter into one loaf pan, it baked up. And over. And onto the oven grating. And piled up in a crispy baked pile of dripped batter on the bottom of the oven. (Which reminds me, I should clean that up. Eh. Tomorrow!) And to make it worse, the centre didn’t set! I don’t think it was the just that I put too much batter in the loaf pan, I really think the recipe was not the best to start with. So I had a loaf that was liquid in the centre, crispy on the edges, and stuck in the pan everywhere. But did I fret? Did I despair? No! (Actually, I kind of did fret.) I let it sit in the pan to cool, thinking it would firm up a bit. And it did, although I still had to spoon out the uncooked batter from the centre! Then I couldn’t get it out of the pan. Until I sort of sawed off the edges and ran a plastic knife around the loaf before turning it out onto a cooling rack. I looked at it. I asked myself, can this cake be saved? I thought…trifle! So I tore up the cake into small chunks, stuck in the fridge and went to bed. I was tired. It was midnight. And this baker needs her beauty sleep. Today after work, I bounced home and started to make the trifle. Or at least, a version of it, using whatever I had lying around in the kitchen. Which is sort of how I cook. (What’s on sale? What do I have in my kitchen? Let’s get cooking!) 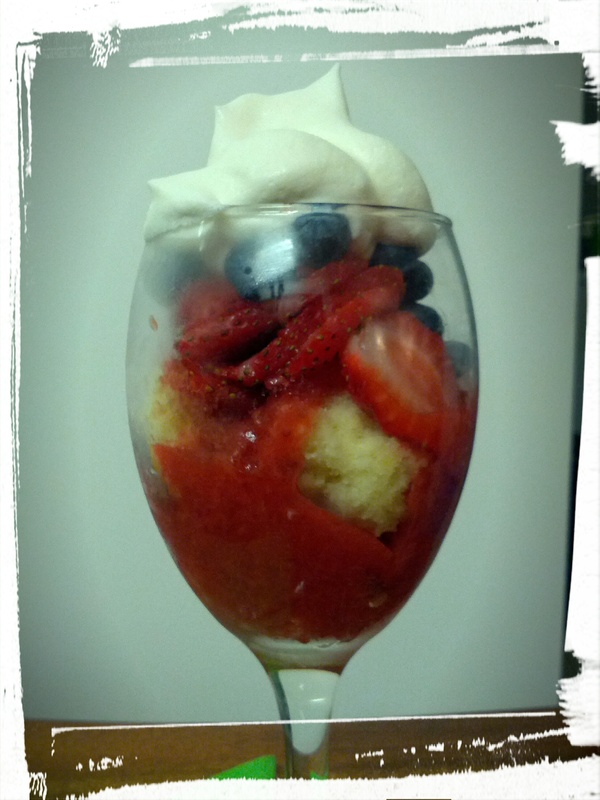 I don’t have a glass trifle container so I used chunky wine glasses, parfait-style, used some of the strawberry-peach jam that I wrote about in my previous post, some berries, and some whipping cream, and voila! Fresh Fruit Poundcake Parfait! The DH thoroughly enjoyed his, which made me happy, and I was glad that the cake didn’t go to waste. I hate wasting food. There’s still some pound cake left and I shall probably freeze that to make cake pops sometime. Waste not, want not! Also cake pops = delicious. And easy to stick in the freezer to pull out for company. Bonus! The verdict: So. Who was the winner? I didn’t expect this (you all probably did), but…Martha! I loved the flavour and the moistness and although it seemed like a bit more work to add in the syrup step, it was definitely worth it for the added moistness. The candied lemon slices I’d skip, though. The recipe that I tried today was too egg-y for my taste and just…not the best, despite appearing light and fluffy. I also think the glaze recipe makes too much. So if you want to make a lemon pound cake, definitely use Martha’s recipe! Don’t expect it to last long, though, as people will gobble it up! Next Post: In search of the perfect pie crust! Or, meaty adventures. This entry was posted in Cakes, Parfaits and Trifles, Recipe Smackdown on August 23, 2014 by Margaret.